THEY MET AT HIS REQUEST on at least six different occasions, beginning in February 1869. With everyone present, there were just nine in all—the seven distinguished consultants he had selected; his oldest son, Colonel Washington Roebling, who kept the minutes; and himself, the intense, enigmatic John Augustus Roebling, wealthy wire rope manufacturer of Trenton, New Jersey, and builder of unprecedented suspension bridges. They met at the Brooklyn Gas Light Company on Fulton Street, where the new Bridge Company had been conducting its affairs until regular offices could be arranged for. They gathered about the big plans and drawings he had on display, listening attentively as he talked and asking a great many questions. They studied his preliminary surveys and the map upon which he had drawn a strong red line cutting across the East River, indicating exactly where he intended to put the crowning work of his career. The consultants were his idea. In view of “the magnitude of the undertaking and the large interests connected therewith,” he had written, it was “only right” that his plans be “subjected to the careful scrutiny” of a board of experts. He did not want their advice or opinions, only their sanction. If everything went as he wanted and expected, they would approve his plan without reservation. They would announce that in their considered professional opinion his bridge was perfectly possible. They would put an end to the rumors, silence the critics, satisfy every last stockholder that he knew what he was about, and he could at last get on with his work. To achieve his purpose, to wind up with an endorsement no one could challenge, or at least no one who counted for anything professionally, he had picked men of impeccable reputation. None had a failure or black mark to his name. All were sound, practical builders themselves, men not given to offhand endorsements or to overstatement. With few exceptions, each had done his own share of pioneering at one time or other, and so theoretically ought still to be sympathetic to the untried. They were, in fact, about as eminent a body of civil engineers as could have been assembled then, and seen all together, with their display of white whiskers, their expansive shirt fronts and firm handshakes, they must have appeared amply qualified to pass judgment on just about anything. The fee for their services was to be a thousand dollars each, which was exactly a thousand dollars more than Roebling himself had received for all his own efforts thus far. Then there was Colonel Julius Adams of Brooklyn, a former Army engineer, who was usually described as an expert on sewer construction, and who, in truth, was not quite in the same league as the others. He had, however, a number of influential friends in Brooklyn and for years he had been dabbling with designs for an East River bridge of his own. For a while it had even looked as though he might be given the chance to build it. When Roebling’s proposal was first made public, he had been among those to voice sharp skepticism. That he had been included as a consultant at this stage was taken by some as a sign that Roebling was not entirely the political innocent he was reputed to be. William Jarvis McAlpine, of Stockbridge, Massachusetts, was the president of the American Society of Civil Engineers. Kindly, genial, widely respected, he had built the enormous dry dock at the Brooklyn Navy Yard, the Albany Water Works, and a fair number of bridges. He was also the proud possessor of what must have been the most elaborate jowl whiskers in the profession and he was the one man in the group, the two Roeblings included, who had had any firsthand experience working with compressed-air foundations, or caissons, as they were called, which, in this particular case, was regarded as an attribute of major proportions. Probably the best-known figure among them, however, was Benjamin Henry Latrobe of Baltimore, who had the face of a bank clerk, but whose endorsement alone would perhaps have been enough to settle the whole issue. He was the son and namesake of the famous English-born architect picked by Jefferson to design or remodel much of Washington, and who rebuilt the Capitol after it was burned by the British during the War of 1812. He had laid out most of the B&O Railroad and had been in charge of building a number of exceptional bridges in Maryland and Virginia. And finally there was John J. Serrell, the only builder of suspension bridges in the group except for the Roeblings; J. Dutton Steele, chief engineer of the Reading Railroad; and James Pugh Kirkwood, a rather mournful-looking Scotsman who was an authority on hydraulics, among other things, and who, in 1848, in northeastern Pennsylvania, had built the beautiful stone-arched Starrucca Viaduct, then the most costly railroad bridge in the world. There is no way of knowing what thoughts passed through the minds of such men as they first looked over Roebling’s drawings and listened to him talk. But it is also hard to imagine any of them remaining unimpressed for very long, for all their collective experience or their own considerable accomplishments or any professional jealousies there may have been. Nor does it seem likely that any of them failed to sense the historic nature of the moment. Roebling was the recognized giant of their profession, a lesser-Leonardo he would be called, and even on paper his bridge was clearly one of the monumental works of the age. To an engineer especially that would have been obvious. A bridge over the East River, joining the cities of New York and Brooklyn, had been talked about for nearly as long as anyone could recall. According to the best history of Brooklyn ever written, a three-volume work by a medical doctor named Henry R. Stiles, Volume II of which appeared that same year of 1869, the idea for a bridge was exactly as old as the century, the first serious proposal having been recorded in Brooklyn in 1800. Stiles wrote that an old notation, found in a scrapbook, referred to an unnamed “gentleman of acknowledged abilities and good sense” who had a plan for a bridge that would take just two years to build. Probably the gentleman was Thomas Pope of New York, an altogether fascinating character, a carpenter and landscape gardener by trade, who had designed what he called his “Flying Pendent Lever Bridge,” an invention, as he saw it, available in all sizes and suitable for any site. His bridge to Brooklyn was to soar some two hundred feet over the water, with a tremendous cantilever fashioned entirely of wood, like “a rainbow rising on the shore,” he said in the little book he published in 1811. Thomas Pope’s “Rainbow Bridge” was never attempted, however, and fortunately so, for it would not have worked. But his vision of a heroic, monumental East River bridge persisted. Year after year others were proposed. Chain bridges, wire bridges, a bridge a hundred feet wide, were recommended by one engineer or another. “New York and Brooklyn must be united,” Horace Greeley declared in the Tribune in 1849, while in Brooklyn a street running down to the river was confidently christened Bridge Street. In April 1867 a charter authorizing a private company to build and operate an East River bridge had been voted through at Albany. The charter was a most interesting and important document, for several different reasons, as time would tell. But in the things it said and left unsaid concerning the actual structure to be built, it was notable at a glance. Not a word was mentioned, for example, about the sort of bridge it was to be or to suggest that its construction might involve any significant or foreseeable problems. The cities were not required to approve the plans or the location. The charter said only that it be a toll bridge. It was important that it have a “substantial railing” and that it be “kept fully lighted through all hours of the night.” It was also to be completed by January 1, 1870. A month after the charter became law, Roebling had been named engineer of the work. By whom or by what criteria remained a puzzle for anyone trying to follow the story in the papers. In September, that same year, 1867, at a private meeting held in Brooklyn, he presented his master plan in a long formal report. But such was “the anxiety manifested on the part of the press of the two cities to present his report to the public, that it was taken and published, as an entirety . . .” The bridge had no official name at this point, and in the time since, nobody seemed able to settle on one. At an earlier stage it had been referred to occasionally as the Empire Bridge, but the organization incorporated to build it was called the New York Bridge Company, because the Brooklyn people behind the idea saw it as just that—a bridge to New York. Roebling, on the other hand, had referred to it as the East River Bridge in his proposal and the newspapers and magazines had picked up the name. But it was also commonly called the Roebling Bridge or the Brooklyn Bridge or simply the Great Bridge, which looked the most impressive in print and to many seemed the most fitting name of all, once they grasped what exactly Roebling was planning to do. But it was the possible future impact of such a structure on their own lives that interested people most, naturally enough, and that the press in both cities devoted the most attention to. The Times, for example, described the bridge as a sort of grand long-needed pressure valve that would do much to alleviate New York’s two most serious problems, crime and overcrowding. In Brooklyn, where interest was the keenest, it was said the bridge would make Brooklyn important, that it would make Brooklyn prosper. Property values would soar. Roebling the alchemist, would turn vacant lots and corn patches into pure gold. Everybody would benefit. Brooklyn was already expanding like a boomtown, and the bridge was going to double the pace, the way steam ferries had. Merchants could expect untold numbers of new customers as disaffected New Yorkers flocked across the river to make Brooklyn their home. Manufacturers would have closer ties with New York markets. Long Island farmers and Brooklyn brewers could get their wares over the river more readily. The mail would move faster. Roebling had even told his eager clients how, in the event of an enemy invasion of Long Island, troops could be rushed over the bridge from New York in unprecedented numbers. In such an emergency, the old Prussian had calculated, nearly half a million men, together with artillery and baggage trains, could go over the bridge in twenty-four hours. Most appealing of all for the Brooklyn people who went to New York to earn a living every day was the prospect of a safe, reliable alternative to the East River ferries. Winds, storms, tides, blizzards, ice jams, fog, none of these, they were told, would have the slightest effect on Mr. Roebling’s bridge. There would be no more shoving crowds at the ferryhouse loading gates. There would be no more endless delays. One Christmas night a gale had caused the river to be so low the ferries ran aground and thousands of people spent the night in the Fulton Ferry house. Many winters when the river froze solid, there had been no service at all for days on end. And such highly regarded Brooklyn residents as Walt Whitman and James S. T. Stranahan, the man behind Brooklyn’s new Prospect Park, looked to the day when the bridge would make Brooklyn and New York “emphatically one,” which was also generally taken to be a very good thing, since the new Union Pacific Railroad was going to make New York “the commercial emporium of the world.” This was no idle speculation, “but the natural and legitimate result of natural causes,” according to John Roebling. His bridge was part of a larger mission. “As the great flow of civilization has ever been from East towards the West, with the same certainty will the greatest commercial emporium be located on this continent, which links East to the West, and whose mission it is in the history of mankind to blend the most ancient civilization with the most modern.” The famous engineer, it had been noticed in Brooklyn, tended to cosmic concepts, but so much the better. If there were now forty million people crossing the East River every year, as was the claim, then, he said, in ten years’ time there would be a hundred million. This, in other words, was to be something much more than a large bridge over an important river. It was to be one of history’s great connecting works, symbolic of the new age, like the Atlantic cable, the Suez Canal, and the transcontinental railroad. “Lo, Soul, seest thou not God’s purpose from the first?” wrote Walt Whitman at about this time. “The earth be spann’d, connected by network . . . The lands welded together.” “The shapes arise!” wrote the Brooklyn poet. Singing the strong, light works of engineers . . . The completed work, when constructed in accordance with my designs, will not only be the greatest bridge in existence, but it will be the greatest engineering work of the continent, and of the age. Its most conspicuous features, the great towers, will serve as landmarks to the adjoining cities, and they will be entitled to be ranked as national monuments. As a great work of art, and as a successful specimen of advanced bridge engineering, this structure will forever testify to the energy, enterprise and wealth of that community which shall secure its erection. Roebling had written that in 1867, at the very start of his formal proposal, but in all the time since, for some mysterious reason, not a spade of dirt had been turned and numbers of people, some claiming to be experts, had begun saying they were not so sure about Roebling’s “advanced engineering,” or whether it was worth the six to seven million dollars he had said it would cost, an estimate that did not include the price of the land required. Even if his figures were realistic, the bridge would also be about the most expensive ever built. The editors of Scientific American said a tunnel would serve the purpose as well and cost less. A Navy engineer presented an alternative plan. He wanted to block off “the vexatious East River” with a dam several hundred feet wide on which he would build highways, stores, docks, and warehouses. By early 1869, when it looked as though the bridge might actually be started, the critics were sounding forth as never before. Warehouse owners along the river and others in the shipping business were calling it an obstruction to navigation and a public nuisance. The New York Polytechnic Society put on a series of lectures at Cooper Union devoted exclusively to the supposed engineering fallacies of the Roebling plan. Engineers expressed “grave apprehension.” The bridge, it was stated on the best professional authority, was a monumental extravagance, “a wild experiment,” nothing but an exercise in vanity. Even in Brooklyn the Union said another bridge and a tunnel besides would probably be built by the time everyone finished wrangling over details and questioned why, for so momentous a public work, only one engineer had been called on and no other plans ever considered. So it had been to still such talk that Roebling had assembled his seven consultants and with total patience and candor went over everything with them point by point. To begin with it was to be the largest suspension bridge in the world. It was to be half again the size of his bridge over the Ohio at Cincinnati, for example, and nearly twice the length of Telford’s famous bridge over the Menai Strait, in Wales, the first suspension bridge of any real importance. It was to cross the East River with one uninterrupted central span, held aloft by huge cables slung from the tops of two colossal stone towers and secured on either shore to massive masonry piles called anchorages. These last structures alone, he said, would be a good seven stories tall, or taller than most buildings in New York at the time. They would each take up the better part of a city block and would be heavy enough to offset the immense pull of the cables, but hollow inside, to provide, Roebling suggested, room for cavernous treasury vaults, which he claimed would be the safest in America and ample enough to house three-quarters of all the investments and securities in the country. His towers would dwarf everything else in view. They would reign over the landscape like St. Peter’s in Rome or the Capitol dome in Washington, as one newspaper said. In fact, the towers would be higher than the Capitol dome if the dome’s crowning statue of Freedom was not taken into account. So this in the year 1869—when the Washington Monument was still an ugly stone stump—meant they would be about the largest, most massive things ever built on the entire North American continent. On the New York skyline only the slim spire of Trinity Church at the head of Wall Street reached higher. The towers were to serve two very fundamental purposes. They would bear the weight of four enormous cables and they would hold both the cables and the roadway of the bridge high enough so they would not interfere with traffic on the river. Were the two cities at higher elevations, were they set on cliffs, or palisades, such as those along the New Jersey side of the Hudson, for example, such lofty stonework would not be necessary. As it was, however, only very tall towers could make up for what nature had failed to provide, if there was to be the desired clearance for sailing ships. And as the mass of the anchorages had to be sufficient to offset the pull of the cables, where they were secured on land, so the mass of the towers, whatever their height, had to be sufficient to withstand the colossal downward pressure of the cables as they passed over the tops of the towers. Below the water the towers were to be of limestone and each was to be set on a tremendous wooden foundation, but from the waterline up they were to be of granite. In plan each tower was essentially three shafts of solid masonry, connected below the roadway, or bridge floor, by hollow masonry walls, but left unconnected above the bridge floor until they joined high overhead to form the great Gothic arches, which, in turn, were to be topped by a heavy cornice and three huge capstones. The total weight of each tower, Roebling estimated, would be 67,850 tons, but with the weight of the roadway and its iron superstructure added on they would each weigh 72,603 tons. The suspended roadway’s great “river span” was to be held between the towers by the four immense cables, two outer ones and two near the middle of the bridge floor. These cables would be as much as fifteen inches in diameter and each would hang over the river in what is known as a catenary curve, that perfect natural form taken by any rope or cable suspended from two points, which in this case were the summits of the two stone towers. At the bottom of the curve each cable would join with the river span, at the center of the span. But all along the cables, vertical “suspenders,” wire ropes about as thick as a pick handle, would be strung like harp strings down to the bridge floor. And across those would run a pattern of diagonal, or inclined, stays, hundreds of heavy wire ropes that would radiate down from the towers and secure at various points along the bridge floor, both in the direction of the land and toward the center of the river span. The wire rope for the suspenders and stays was to be of the kind manufactured by Roebling at his Trenton works. It was to be made in the same way as ordinary hemp rope, that is, with hundreds of fine wires twisted to form a rope. The cables, however, would be made of wire about as thick as a lead pencil, with thousands of wires to a cable, all “laid up” straight, parallel to one another, and then wrapped with an outer skin of soft wire, the way the base strings of a piano are wrapped. But most important of all, Roebling was talking about making the cables of steel, “the metal of the future,” instead of using iron wire, as had always been done before. There was not a bridge in the country then, not a building in New York or in any city as yet, built of steel, but Roebling was seriously considering its use and the idea was regarded by many engineers as among the most revolutionary and therefore questionable features of his entire plan. His new bridge was to be “a great avenue” between the cities, he said. Its over-all width was to be eighty feet, making it as spacious as Broadway itself, as he liked to tell people, and the river span would measure sixteen hundred feet, from tower to tower, making it the longest single span in the world. But of even greater import than length was the unprecedented load the bridge was designed to bear—18,700 tons. The long river span was not to be perfectly horizontal, but would bow gracefully, gently upward. It would pass through the tower arches at an elevation of 119 feet, but at the center it would be 130 feet over the water. This, as Roebling pointed out, was thirty feet higher than the elevation fixed by the British Admiralty for Robert Stephenson’s Britannia Bridge over the Menai Strait, built nearly twenty years earlier. Before long, sailing ships would be things of the past, he declared. His bridge therefore would be no obstruction to navigation, only possibly “an impediment to sailing.” As it was, only the very largest sailing ships afloat would have to trim their topmasts to pass beneath the bridge. But because of the great elevation of the river span and the relatively low-lying shores, the rest of the bridge, sloping down to ground level, would have to extend quite far inland on both sides to provide an easy grade. The bridge would have to descend back to earth rather gradually, as it were, and thus the better part of it would be over land, not water. Those inland sections of the bridge between the towers and the two anchorages were known as the land spans, and were also supported by the cables, by suspenders and diagonal stays. The ends of the bridge, from the anchorages down to ground level, were known as the approaches. In all, from one end to the other, the Great Bridge was to measure 5,862 feet, or more than a mile. The red line Roebling had drawn on the map ran southeast from City Hall Park, in New York, crossing the river not quite at right angles, at that point where the river was returning to its essentially north-south course. At the Brooklyn Navy Yard—over to the right of the red line—the river turned sharply to the left, heading nearly due west, but then it quickly turned down the map again to merge with the harbor. And it was right there, where the river turned the second time, right about where the Fulton Ferry crossed, that Roebling had put his “Park Line” connecting New York, on the upper left of the map, with Brooklyn, on the lower right. The precise terminating point on the New York side was at Chatham Street, opposite the park. This was the place for the bridge to come in, he said. For the next fifty years the park would remain “the great focus of travel, from which speedy communications will ramify in all directions.” From there his red line crossed over North William Street, William, Rose, Vandewater, and half a dozen more streets, to the end of Pier 29, then over the river, straight through one of the Fulton Ferry slips, and into Brooklyn. Running parallel with Fulton Street, Brooklyn’s main thoroughfare, the line cut across a patchwork of narrow cross streets—Water, Dock, Front, James—to Prospect, where it bent slightly toward Fulton, terminating finally in the block bounded by Prospect, Washington, Sands, and Fulton, or right about where St. Ann’s Church stood. So the roadways and tracks at one level were for the everyday traffic of life, while the walkway above was for the spirit. The bridge, he had promised, was to serve the interests of the community as well as those of the New York Bridge Company. Receipts on all tolls and train fares would, he asserted, pay for the entire bridge in less than three years. To build such a bridge, he said, would take five years. Horatio Allen and William McAlpine asked the most questions during the sessions Roebling held with the consultants. The length of the central span and the tower foundations were the chief concerns. Roebling told his consultants that a span of sixteen hundred feet was not only possible with a suspension bridge, but if engineered properly, it could be double that. A big span was not a question of practicability, but cost. It was quite correct that wind could play havoc with suspension bridges of “ordinary design.” But he had solved that problem long since, he assured them, in his earlier bridges, and this bridge, big as it was, would be quite as stable as the others. Like his earlier works, this was to be no “ordinary” bridge. For one thing it would be built six times as strong as it need be. The inclined stays, for example, would have a total strength of fifteen thousand tons, enough to hold up the floor by themselves. If all four cables were to fail, he said, the main span would not collapse. It would sag at the center, but it would not fall. His listeners were very much impressed. There were questions about his intended use of steel and about the extraordinary weight of the bridge. Then at one long session they had discussed the foundations. Roebling planned to sink two tremendous timber caissons deep into the riverbed and to construct his towers upon these. It was a technique with which he had had no previous experience, but the engineering had been worked out quite thoroughly, he said, in conjunction with his son, Colonel Roebling, who had spent nearly a year in Europe studying the successful use of similar foundations. McAlpine could vouch for the basic concept, since he had used it himself successfully, although on a vastly smaller scale, to sink one of the piers and the abutment for a drawbridge across the Harlem River. His caisson for the pier had been of iron and just six feet in diameter. Those Roebling was talking about would be of pine timbers and each one would cover an area of some seventeen thousand square feet, or an area big enough to accommodate four tennis courts with lots of room to spare. Nothing of the kind had ever been attempted before. How deep did he think he would have to go to reach a firm footing, the engineers wished to know. Would he go to bedrock? And did he have any idea how far down that might be? During the test borings on the Brooklyn side, the material encountered had been composed chiefly of compact sand and gravel, mixed with clay and interspersed with boulders of traprock, the latter of which, he allowed, had “detained this operation considerably.” Gneiss had been struck at ninety-six feet. But below a depth of fifty to sixty feet, the material had been so very compact that the borehole had remained open for weeks without the customary tubing. So it was his judgment that there would be no need to go all the way to rock. A depth of fifty feet on the Brooklyn side ought to suffice and the whole operation would probably take a year. About the prospects on the New York side, he was rather vague—but it looked, he said, as though bedrock was at 106 feet and there was a great deal of sand on the way down. Still there was a chance that rock might be found closer to the surface. An old well near Trinity Church showed gneiss at twenty-six feet, he noted, and in the well at City Hall the same rock was found at ninety feet. “The whole of Manhattan Island appears to rest upon a gneiss and granite formation,” he said. The greatest depth to which similar caissons had been sunk before this was eighty-five feet. But he was willing to take his to a depth of 110 feet if that was what had to be done. His consultants said they did not think he would find that necessary. Presently they took up the question of the timber foundations and their fate, once he left them buried forever beneath the towers, beneath the river, the rock, sand and muck of the riverbed. In his report, Roebling had explained at some length how the caissons would be packed with concrete once they were sunk to the desired position, and why, in their final resting place, well below the level where water or sea worms could reach them, they would last forever. But there were some among the consultants who wished to hear more on the subject and who had a number of questions. Only Congressional authorization was needed now, since Congress had jurisdiction over all navigable waters and the bridge was to be a post road. Unlike the government in Albany, or those in either city, the government in Washington had some regulations it wished to see adhered to. Congressional legislation already drawn up stipulated that the bridge must in no way “obstruct, impair, or, injuriously modify,” navigation on the river. In particular, there was concern in Washington that it might interfere with traffic to and from the Navy Yard. And to be certain that every detail of the plan was fully understood, General A. A. Humphreys, Chief of the Army Engineers, decided to appoint his own review panel to give an opinion on it, irrespective of the conclusions reached by Roebling’s consultants. (This was to be the only public scrutiny of the design or the location.) So at about that point it had seemed the most sensible next step would be for everyone to go take a look at some of Roebling’s existing works to see how he had previously handled somewhat analogous situations. Let his work speak for itself, he had decided. The tour was arranged almost overnight and if there was any initial intention to restrict it to a relatively small body of professionals that idea was speedily overruled. A total of twenty-one gentlemen and one lady made up the “Bridge Party,” as it was referred to in subsequent accounts. In addition to the two Roeblings, the seven consultants, and three Army engineers—General Horatio Wright, General John Newton, and Major W. R. King—several prominent Brooklyn businessmen were invited, most of whom were or were about to become stockholders in the New York Bridge Company. A Brooklyn Congressman named Slocum—General Henry W. Slocum—was included, as were Hugh McLaughlin, the Democratic “Boss” of Brooklyn, and William C. Kingsley, Brooklyn’s leading contractor, who was known to be the driving political force behind the bridge and the largest individual stockholder. How many of the party were aware that the tall, powerful Kingsley would also be personally covering all expenses for the tour, in addition to the seven thousand dollars in consultants’ fees, is not known. Two young engineers, C. C. Martin and Samuel Probasco, both of whom had worked for Kingsley on different Brooklyn projects, were also to go, as was the wife of one of the consultants, Mrs. Julius Adams, who is described only as an “amiable lady” in existing accounts. Why she consented to join the group, or why she was invited in the first place, no one ever explained. Nor is there anything in the record to indicate who determined the make-up of the group. Presumably it was taken to be a representative body, having an even balance of engineering talent, business acumen, and public spirit. In any event, the editor of the Brooklyn Eagle, Thomas Kinsella, was also included, so that in Brooklyn at least the expedition would receive proper notice, and young Colonel Roebling appears to have been the one delegated to make the necessary arrangements. There were, however, two very important public figures who did not make the trip, both of whom had done much to bring the project along as far as it had come and who ought to be mentioned at this point in the story. But the absence of the second missing party was quite intentional, one can be sure; it raised no questions and required no explanation, since there had been no mention as yet, scarcely even a whisper, that he had had anything whatever to do with the bridge. He was William Marcy Tweed of New York. The itinerary called for stops at Pittsburgh, Cincinnati, Niagara Falls, and the announced official purpose of the expedition was to inspect four of Roebling’s bridges, each of which, in one way or other, illustrated how he intended to span the East River. But a week of traveling together was also supposed to give everybody a chance to get to know one another—nothing could so cement friendships as a long train ride, Thomas Kinsella would write—and particularly, it was presumed, everyone would get to know the key man in all this, John A. Roebling. The great engineer was still largely a mystery to the people who had hired him. Except for the times when he had expounded on his plan at the meeting in 1867, his Brooklyn clients had seen very little of him. Their ordinary day-to-day dealings had been with his son. It had been young Roebling, not his father, who had set up the makings of an office and who had taken a house on the Heights. He had been the one on hand to answer their questions and keep things moving. The father had wanted it that way. He had remained in Trenton, showing up in Brooklyn only now and then, and staying no longer than necessary. His time was always short it seemed and even when meeting with his board of consultants he had kept each session quite formal and to the point. He had no time for anything but business, and no small talk whatever. On occasion the two of them, father and son, would be seen walking on Hicks Street, talking intently, or down by the slate-gray river pacing about the spot where the tower was to rise, the father pointing this way and that with his good hand. They resembled each other in height and build, even trimmed their whiskers the same way. But while the son was quite handsome in the conventional sense, with strong regular features, the father’s face was a composite of hard angles and deep creases, of large ears and nose and deep-sunken eyes, all of which gave the appearance of having been hewn from some substance of greater durability than mortal flesh. Most people, later, would talk about his eyes, his fierce pale-blue eyes. But just what sort of human being there might be behind them was a puzzle. He was a man of enormous dignity, plainly enough, full of purpose and iron determination, but accustomed to deference just as plainly, somebody to be admired from a distance. His look was all-knowing and not in the least friendly. Among those who were about to stake so very much on him and his bridge, or who already had, there was not one who could honestly say he knew the man. And so on the evening of April 14, 1869, when General Grant and his Julia were just taking up residence in the White House and the dogwood were beginning to bloom across the lowlands of New Jersey, the Bridge Party boarded a private palace car in Jersey City and started west. The only one missing from the group was the elder Roebling, who was to get on at Trenton. 1. In 1869, conversations about the Brooklyn Bridge took a more serious tone and there was much opposition. 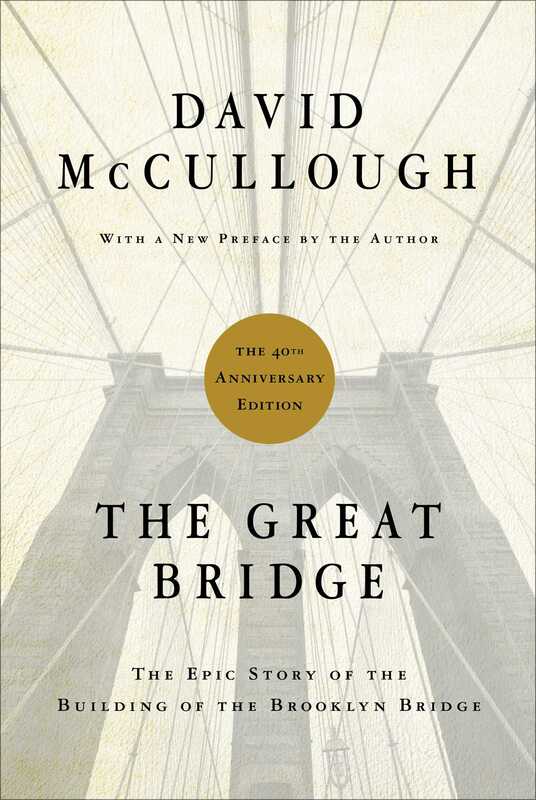 "The bridge... was a monumental extravagance, a wild experiment, nothing but an exercise in vanity." If a less expensive medium for transportation, such as a tunnel, would adequately increase transportation between Brooklyn and Manhattan, why build a bridge of this magnitude? Is there something to be said for grandiose monuments and landmarks? 2. John A. Roebling did not practice organized religion. Like many intellectuals of the time his beliefs were based in spiritualism. Why do you think spiritualism appealed to "practical men of learning"? Do you feel that science and religion is mutually exclusive? How does spiritualism relate to Scientology and other alternative forms of spiritual practice? 3. Prior to the completion of the bridge, you get a sense that Brooklyn is a strong, self-sufficient town. "New York [City] employed considerably less than half of Brooklyn's wage earners, perhaps even as few as one in three." If that is the case, what is the strongest argument for building the bridge? What are the pros and cons of further developing Brooklyn into the "biggest city in the world"? 4. William Tweed was arguably the most powerful and influential man in New York politics. His "Tweed Ring" was built on a system that exorbitantly inflated public expenditures on construction contracts. How were Tweed and the Tweed Ring brought to justice? Can you site similar examples of his organized embezzlement in current local and national politics? 5. The "bends", drastically took its toll on the bridge workers who sunk the New York caisson. What explanations of the disease were the most far-fetched? After the New York caisson was dropped, Colonel Roebling claimed that, "just two deaths could be charged directly to the effects of pressure." Why do you think Roebling botched his final report? If you were in Roebling's position would you have interrupted the project until developing a mechanism such as the "hospital lock" to ensure the safety of the bridge workers? 6. In January of 1875, Henry Ward Beecher, pastor of Plymouth Church was accused of committing adultery with Theodore Tilton's wife. Although it was clear to the general public that Beecher was guilty, the functions of the church continued as usual, and no one was reported to have abandoned the church. 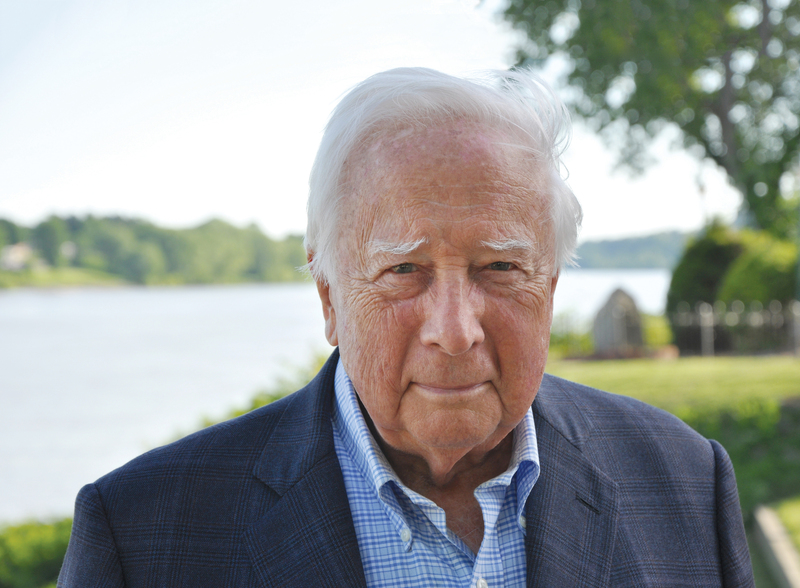 McCullough writes, "a great many people who thought Beecher might be guilty after all would continue to regard him as an extraordinary human being and felt he suffered more than enough." What is your opinion on the sexual misconduct of political and/or religious figures, and the public's treatment of such scandal? Should political and/or religious figures be held to a higher standard of morality? Explain. 7. William Roebling's health began to deteriorate to the extent that he rested at home and conducted his responsibilities as Engineer-in-Chief through correspondence via his wife. With mounting medical and person expenses that outweighed his $10,000 salary, what is Roebling's driving motivation and commitment to the bridge? Have you or anyone you know been so dedicated to a passion that hard work led to the denial of health and personal wellbeing? Share your experience. Is that kind of dedication frowned upon or encouraged by today's culture? 8. After E.F. Farrington was the first to cross the Brooklyn Bridge, his pioneering effort became a huge spectacle and he became a media sensation. Do you think he felt guilty receiving so much attention when Roebling was working from his sickbed? Why did the act of being the first to cross the bridge garner more media attention than the individual whose expertise carried the bridge to fruition? 9. In a dispute over the Bessimer steel contract, why was Hewitt personally invested in discrediting Roebling despite his attempt to remain out of the public arena? 10. When workmen were digging foundations for the Brooklyn approach, the Eagle published an essay on the bridge as "the coming place for the truly artistic suicide." During this time, what did the bridge symbolize in terms of birth, death, triumph, and spectacle? 11. In 1882, the bridge was just about complete. McCullough writes, "for the first time since his father's death... Roebling could relax a little... his services were no longer vital." At this point, why didn't Roebling step down from his position as Engineer-in-Chief, and name a successor to complete the bridge? What did he have to loose? 12. In 1883, the bridge was finally complete. As a response to Hewitt's presentation of the bridge as a great symbol of progress, Roebling writes, "the advantages of modern engineering are in many ways balanced by the disadvantages of modern civilization." What are those disadvantages? Do you agree with this statement? Explain.